Hey Sammy, I am glad that you could find a few pics that worked. I checked out the link to the National Park Service and they do have a lot of interesting information there. Keep up the good work! That history is awesome! Thanks for doing your research Sam! The old coast guard cabin was bought by my Dad in late 1948 and we still own it. Would like to get more pictures of the south point area in the late 40's. Can you point me to anyone who might have some? 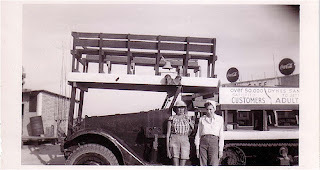 My Uncle and my folks both had a cabins on SPI from about 1950 until 1962. I remember seeing the Coast Guard Station catch fire in the mid-fifties. Also have fond memories of Lee's Cafe where we used to wait for Captain Sullivan's "Betty Rose" to make it's 3 mile trip from Port Isabel. 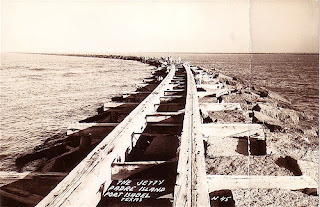 The wooden structure on the Jetties was built for the railroad engine as the Jetty was constructed. As the granite blocks were laid, the railroad was extended. Our cabins used some of the wood for the it's foundation. When the causeway was built, our small cluster of cabins at the Point were relocated about 2 miles North on the East side of the highway near the Sandy Retreat Motel. The only road (sand of course) was created by two army half-tracks that belonged to Dyke & Rita Powell who lived on SPI year round and provided taxi service for the tourists and fishermen who came to fish on the Jetties. They had three sons, Lewis, Leon and Raymond. Dyke later moved to Mercedes where we lived and went to work for the Water District. My Uncle's family still owns their original cabin. Hi I was googling pictures of old South Padre and found these which I had posted on Flickr. I have about 20,000 pictures, many of which were taken by my mother stored there. I didn't realize that they were downloadable, but I am actually glad they are here. But I have to let you know that the three images are copyright, 2010, Estate of Mary W. Stephens, all rights reserved. I am happy for you to look at them on this Blog. I would love to hear stories about Lee's Cafe, which my grandfather owned. These pictures were taken when my parents visited him in 1946 and 1947 I think. I have a lot of them taken in the Valley. I sent two more pictures of my parents to the blogmaster here, and I hope he publishes them on his blog. They are my parents enjoying the beach in 1947. I want to thank the author of this blog, whom I know did not intend to violate any copyright restrictions, for having the courtesy of not publishing the two pictures of my parents, but I hope that he does and I hope you enjoy them. My parents were very much in love with the Texas landscape as with each other. And my mom was pretty daring wearing a bikini in 1947, although she was being very current as it had just been introduced in Paris in 1946. My mother said you took a motor boat across the laguna and that Mrs. Dykes (I did not know she was married) drove you over the dunes on her half-track, which was not a water craft, but something left over from the War, and that is her and my Mom in the bandana. Birdie, my grandfather's third wife, cooked food in the cafe, my Mom also told me, while my Grandfather, Grandad, chewed the fat, drank beer and fished with people on the island and visitors. They both lived in Port Isabel. I see a second building in the picture next to Lee's--it looks made out of stone. So that puts to rest it being the only building, but to my Mom, who told me this, it was just about the only building on the beach. I remember also when there was just the Jetties Restaurant which is where my Grandfather's shack was. My mom said it was cool driving over the dunes in the half track, there was absolutely nothing there. I remember it slowly being built up and it breaks my heart about what is now happening in the Gulf. I remember all the tar from the 1980's and when there were sand dollars on the beach. This is cool, thanks for sharing the history. Love the comments on this blog. Walt, Snuffy Smith, and Roger Stephens all had very interesting factual information. Lets hear more! PS: I tried to find Roger Stephens pictures on Flickr but I had no luck.